Jacqueline boasts a contemporary take on this lovely scroll boucle lace. Its soft braided yarns give this gorgeous panel a chenille effect. Each panel, sold separately, measures 50 inches wide and come it lengths of 84", 95", and 108". Two panels fit a standard single window. It features a 2 inch rod pocket and 1-1/2 inch header, with 1 inch side hems and 3" bottom hem. The panels is constructed of 100% Polyester and is washable. 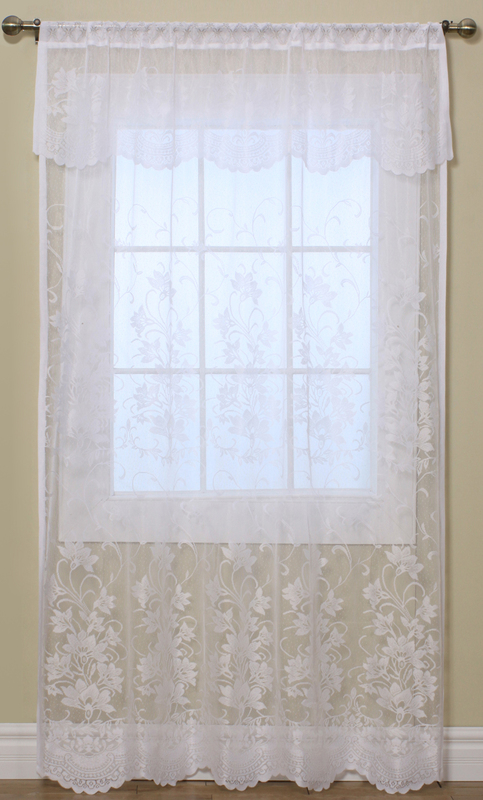 Finish your windows in traditional bridal lace style with the lovely Mona Lisa Curtain Panel Ensemble. This engineered jacquard sheer lace is adorned with a delicate floral pattern throughout to scalloped bottom edge. Mona Lisa Lace softens the look of any window as it gently filters daylight in. The Tailored Panel, sold individually, is 56 inches wide and is offered in lengths of 54, 63, 72, and 84 inches. Panels have a 1 1/4 inch rod pocket and 1 1/4 inch header, with selvedge side. The beautiful adjustable Tailored Balloon Curtain, shown in center, measures 56inches wide and 63 inches long, and features 5 columns and 6 rows of rings making the panel simple to adjust to your perfect length. The Balloon Curtain also has a 1 1/4 inch rod pocket and header. The Tailored Swag pair, measuring 72 inches wide by 32 inches long, is shown with the Tailored Valance inserted between the two pieces. Both have a 1 1/4 inch rod pocket and header. Colors include White, Shell, Warm Sand, Grey, Soft Pink, and Whisper Blue. Made of easy care 100% Polyester, and washable. 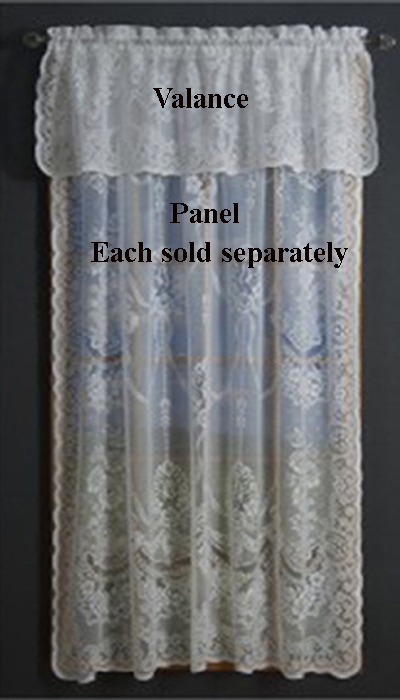 American Balmore Lace Tailored Panel - Country Curtains. Previously offered by Country Curtains. Made in the U.S., American Balmore Lace boasts of traditional elegance with a modern touch, and a cotton-soft look and feel. Inspired by turn of the century Scottish lace, its rich jacquard design features a floral pattern with ribbons. The side and bottom edges are enhanced with gentle scallops. 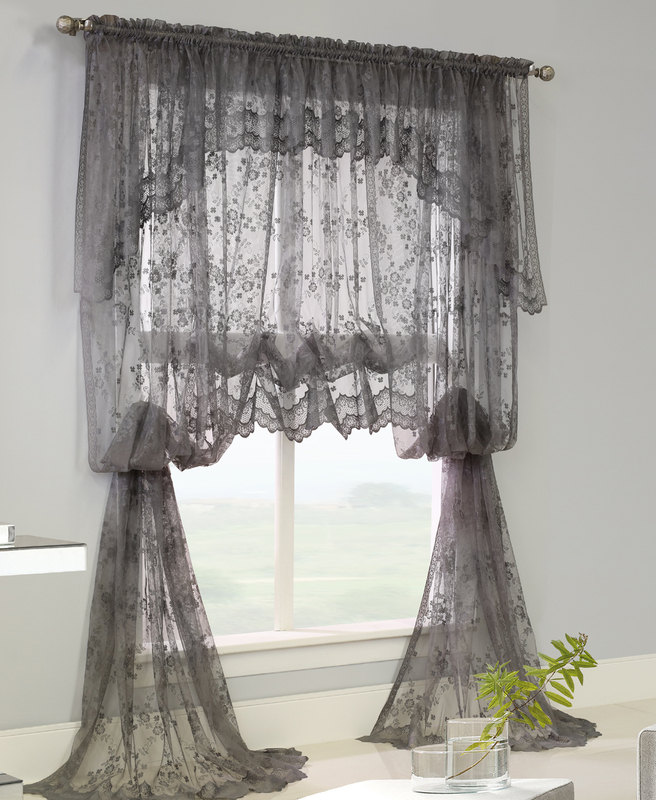 Hang these delicate lace curtains side by side, or add interest with a valance. For real elegance, create a sumptuous look by layering two lace window panels and drawing back the top one to reveal beautiful overlapping swirls and scallops. This photograph illustrates one panel with a valance, which is not attached and is sold separately. 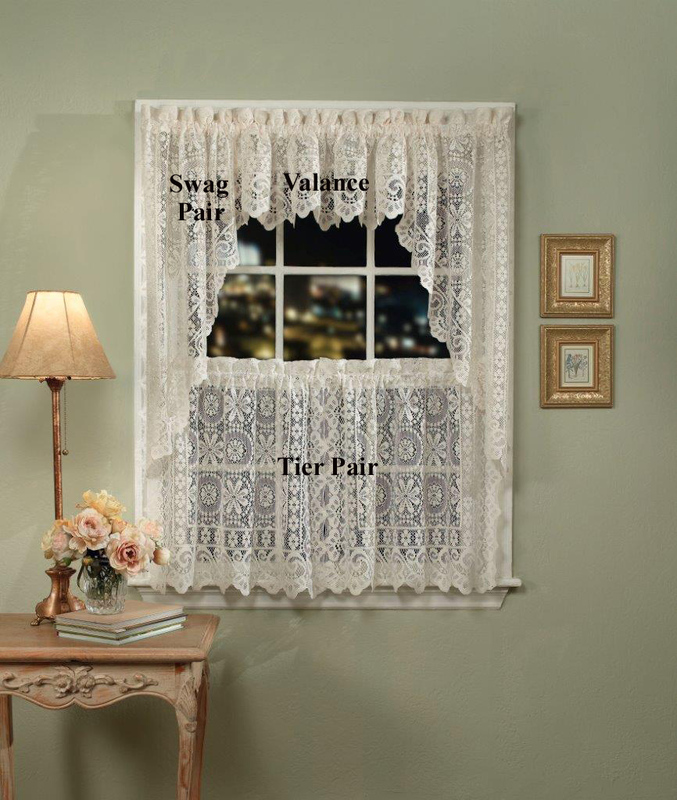 Each American Balmore Lace curtain panel has a 1 1/2" rod pocket. Bring a delicate sophistication to your dining room, living room, entry room or formal room with these luxurious lace curtains. These tailored panels are available in standard and custom sizes and usually ship the next business day from The Curtain Shop. Rod pocket is 1 1/2". 54"W x 63"L Available in Ivory only. 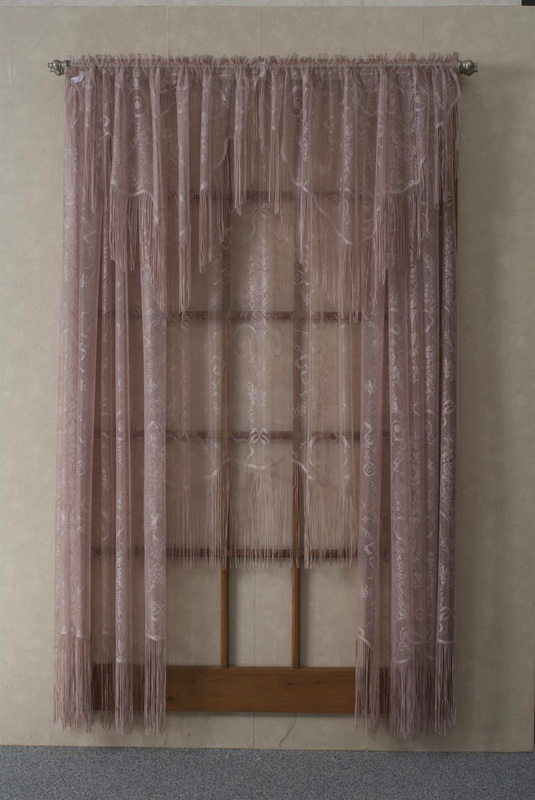 Elegant and beautiful Vanessa Lace Curtain Panels create a soft, romantic look for any room in your home. Components are made from fine gauge jacquard polyester lace. Photo illustrates one tailored valance, and two lace panels. Rod Pocket is 1.5", 1 1/2" header, no side hems, bottom edge is scalloped. Panels packaged and sold individually, one per package. White or Clear rod standard 1" rod is recommended for hanging. A small diameter decorative rod may also be used. Machine wash warm water, tumble dry low heat or drip dry, little or no ironing needed. Do not bleach. Irish Point is a fine gauge jacquard lace inspired by traditional Irish Point design. 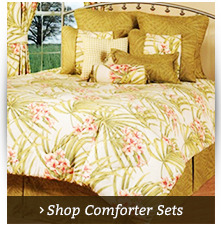 Curtains offered are as tailored pairs and valances. 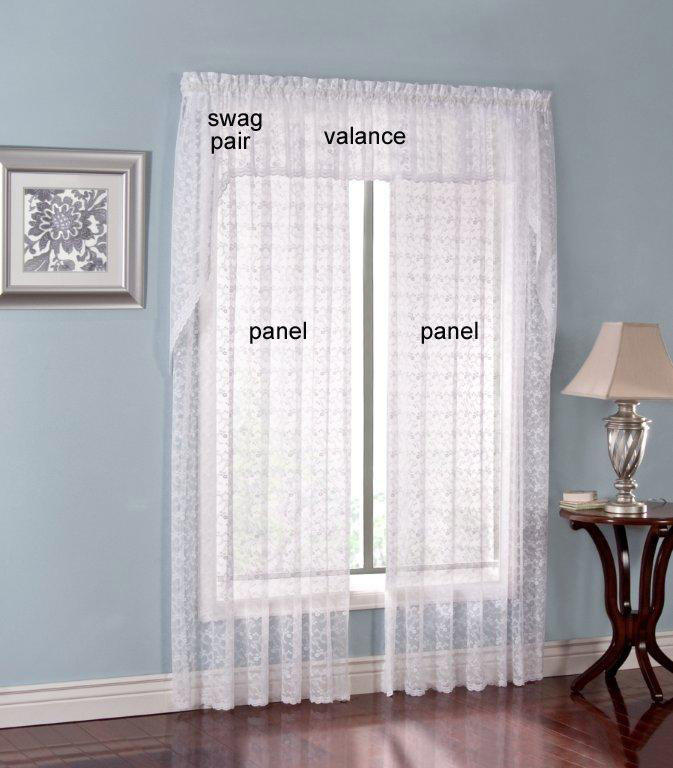 NOTE, Photo illustrates one pair of curtains and one valance. Valance and Curtains are sold separately. 100% Polyester. Machine wash, warm water, tumble or drip dry. Do not use bleach. Use two panel for a standard window. Fiona Lace is a Scottish lace inspired design made on fine gauge jacquard looms. Imported. NOTE: Photo illustrates two Panels each sold separately. Swag Pair is not included. Machine wash water, tumble dry low heat or drip dry. Little or no ironing. Do not bleach. An 18 gauge overall floral crushed lace tailored panel. Select lengths of 63" and 84". Panels are 55" wide and sold individually. Requires two panels for a standard single window. Photo shows two tailored panels with matching swag. All components are sold separately. Sensationally elegant knitted lace panel uses layered ruffles to create this elaborate bouffant style panel. Each panel is 60" wide and is offered in lengths of 63" and 84". 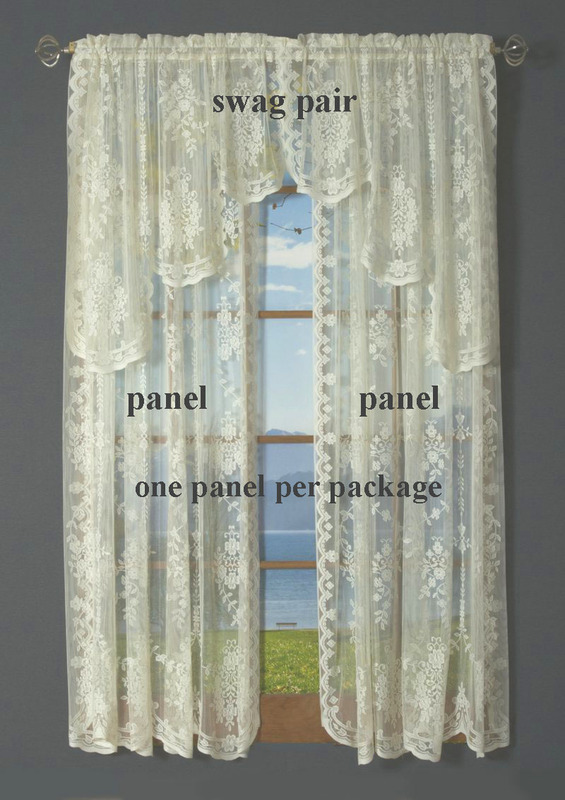 63" panels features six lace layers, 84" feature eight lace layers. 1 1/2" rod pocket and header. Two panels fits a standard single window. Priscilla Bridal Lace features delicate over all floral scrolled bridal lace with beautifully embellished scalloped bottom edge. 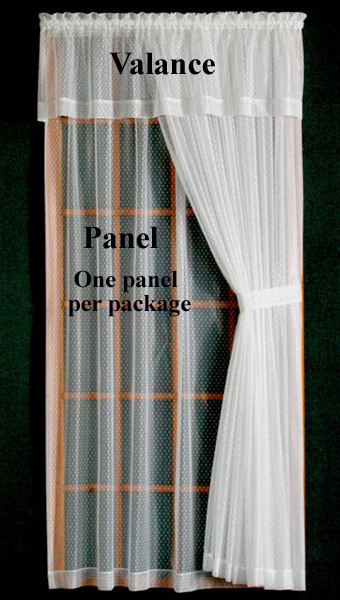 Panels are sold individually, one panel per package. 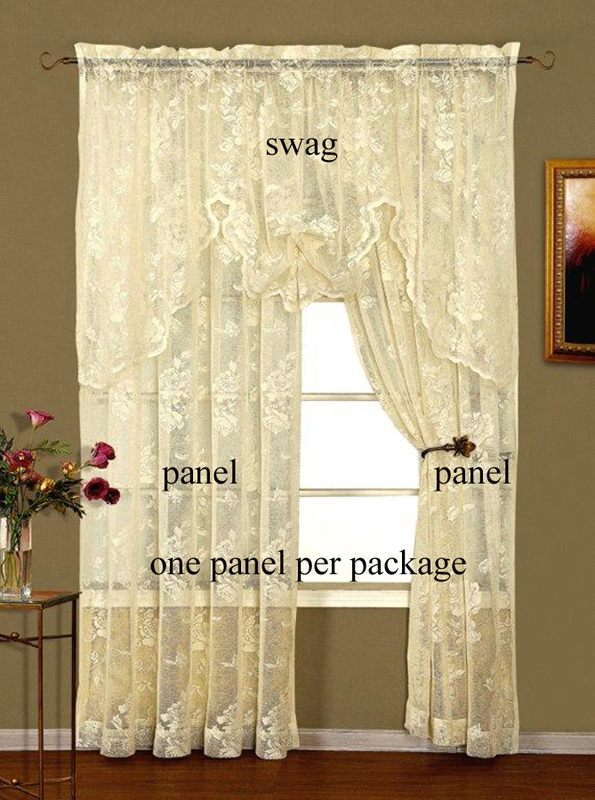 Photo shows TWO panels with Swag and Valance, not included. Add distinction to the windows and doors of your home with our classic Rachel Lace with dotted swiss motif. 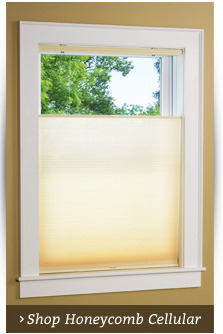 Window panels have a 1 1/2" rod pocket and scalloped edges. They are 60 inches wide and come in lengths of 54", 63", 72", 84", and 95". 100% Polyester and machine washable. Imported from Europe. 56"W x 84"L One panel per package. Ascot Valance not included. 1 1/2" rod pocket and header. 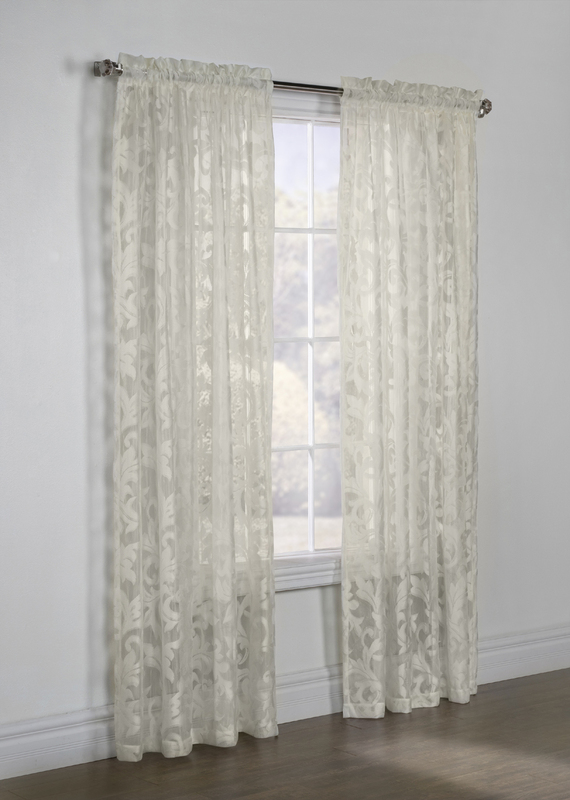 Add sheer elegance to any room in your home with Contessa rod pocket curtain panels. This lovely fine gauge Jacquard lace ensemble that softly diffuses light is unmatched in both quality and looks. Fringed Ascot Valances are sold separately. Panels are packaged and sold individually. Colors: White, Ivory, Rose, Gold, Taupe. Brittany is reminiscent of the heavy weight old time Scottish laces. This lace has a beautifully soft texture to it. The allover medallion pattern flowing to the elegant scalloped bottom. 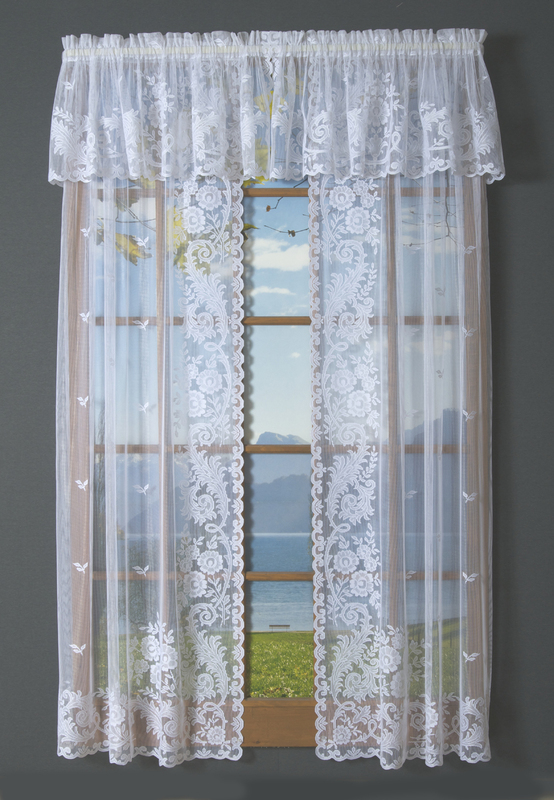 Brittany Lace Rod Pocket Panels look enchanting, with or without the matching valance. Each panel, sold individually, measures 50 inches wide and is offered in lengths of 84, 95, and 108 inches. The rod pocket is 2 inches and header is 1 1/2 inches, with 1 inch side hems. 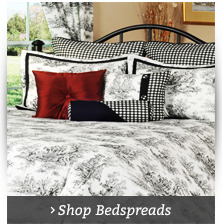 The Brittany Lace Ensemble is made of 100% Polyester, making it easy care and washable. Comes in White only. The Valance measures 50 inches wide by 16 inches long, and also has a 2 inch rod pocket and 1 1/2 inch header with engineered scalloped bottom to match the curtains. Columbus is a two tone cationic lace made of easy care 100% Polyester. Photograph illustrates two 84"L tailored curtain panels, two tailored valances, and one tailored balloon shade; each item is sold separately. Each component has a 1-1/2 inch rod pocket, 1-1/2 inch header, and 1 inch side hems. Use a one inch standard rod or a 3/4" diameter (or less) decorative rod. The Tailored Valance measures 55" wide and 16" long. 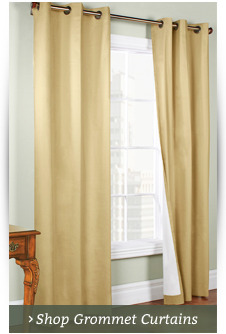 The Tailored Curtain Panels measures 55 inches wide in lengths of 63, 84, and 95 inches. The Tailored Balloon shade measures 55 inches wide and 63 inches long (flat measurement), and has adjustable rings sewn on the back for displaying in various lengths. Everything looks better with a touch of lace. Lace curtains are simply one of the designer staples that never goes out of style and at TheCurtainShop.com, we have beautiful lace window curtains that are sure to please even the most discerning of designers. If you are searching for a panel lace curtain to dress up a full length window or patio door, The Curtain Shop has several attractive options to choose from. We have tailored rod pocket lace curtains that will look simply amazing on a full length window or French door and insulated lace grommet panels that make your home more energy efficient. We also carry Windsor LaceDoor Panels to completely cover the open window of the door while still allowing you to see when a visitor knocks. 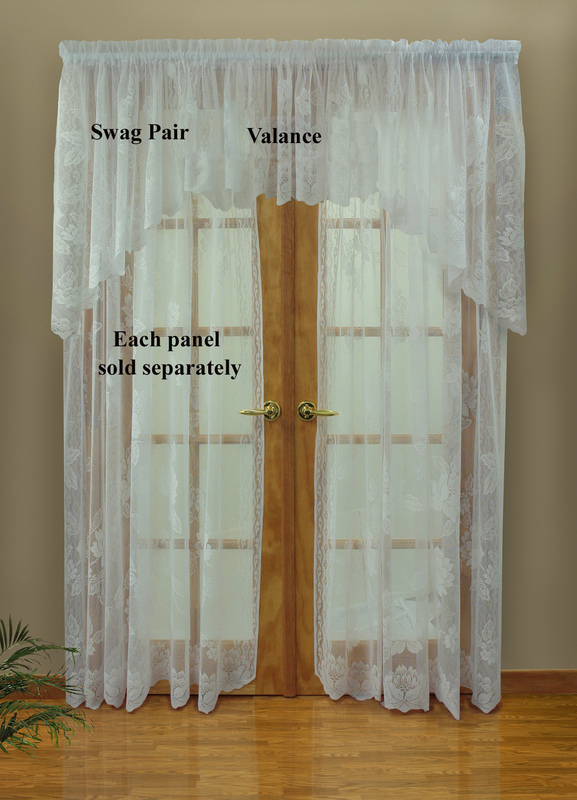 Lace rod pocket curtains are available in several different styles and colors. Curtains are available in single panels or sets that include a pair of window panels and a matching valance. 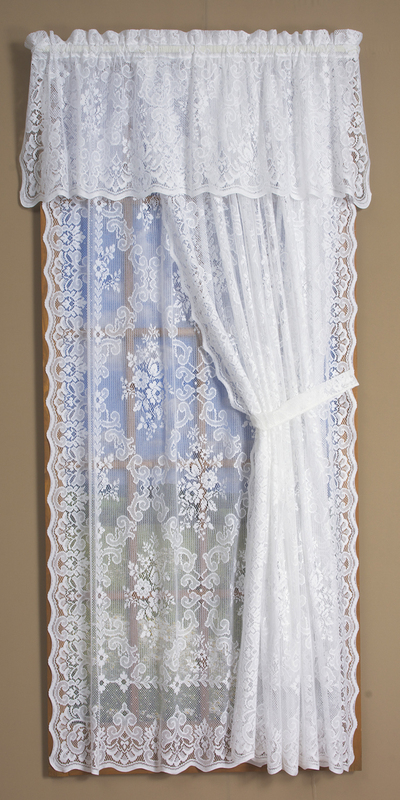 Our Irish Point Lace Curtains are particularly popular and come in 2 color choices. 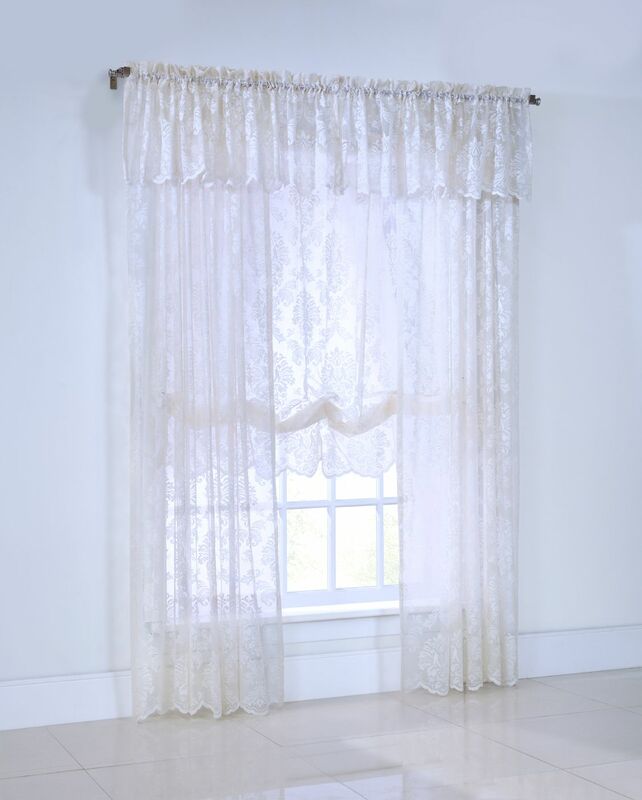 If you're worried that a lace curtain will be too breezy, TheCurtainShop.com has an insulated lace Grommet panel that's a wonderful option. The insulated backing helps to make your room more energy efficient by keeping the warmth in during the winter as well the coolness in the summer. It's also helpful in blocking the sunlight and adds heft to traditionally lightweight lace. 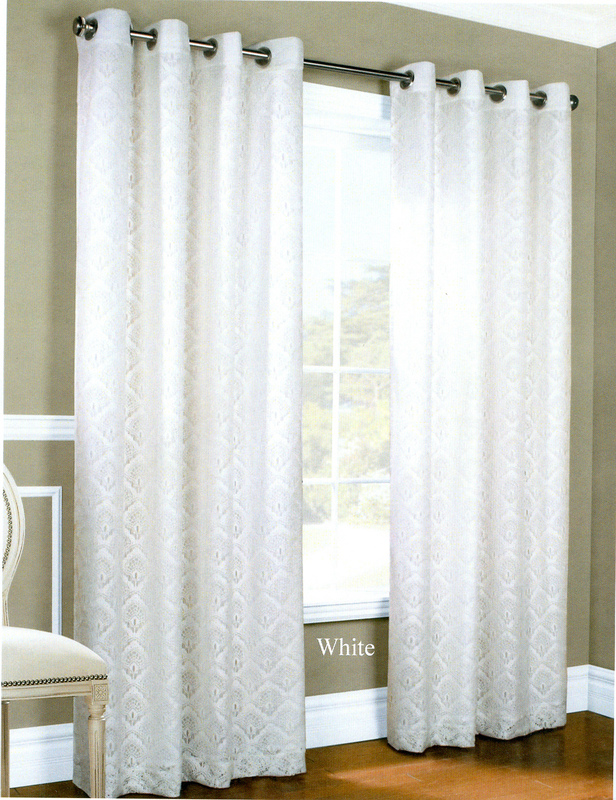 An insulated lace panel provides all the benefits of a regular insulated curtain along with the beauty of lace. 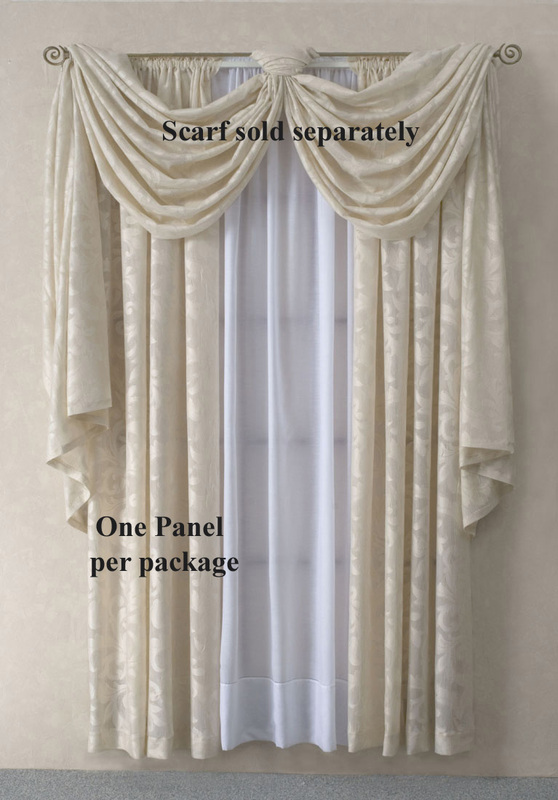 When it comes to lace window treatments, TheCurtainShop.com is the leading authority. Our large selection of curtains includes all of the latest styles as well as old favorites to ensure your new lace curtains don't disappoint. If you love the look and feel of lace, then you will certainly be able to find the perfect style to complement your décor at a price you can afford. 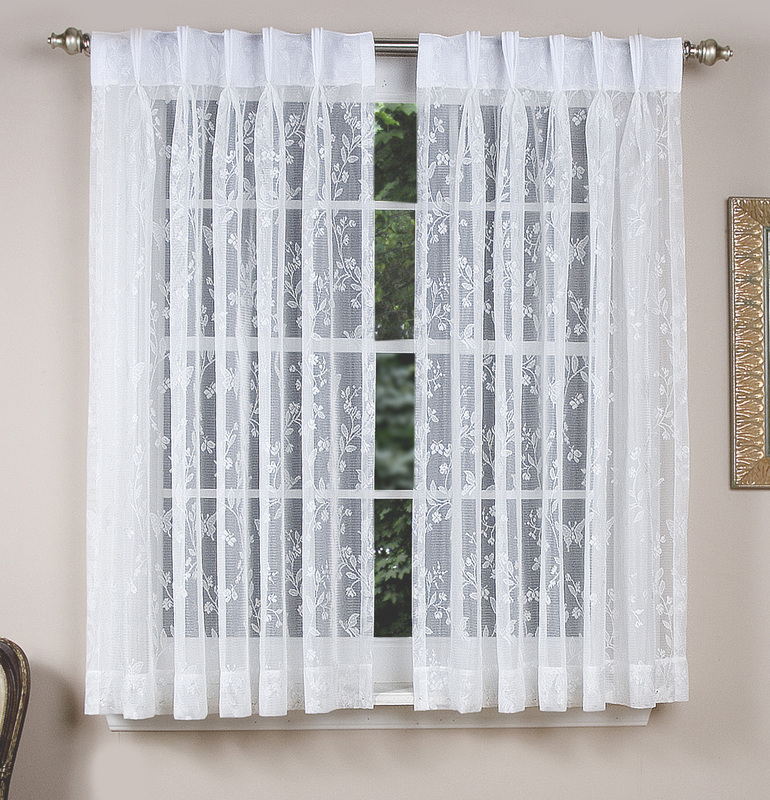 Our value-priced lace curtains make dressing up your windows simple and inexpensive.